This week we received good news from google including phone calling support from gmail. This feature is far from perfect and we expected it to improve a lot yet (specially in voice quality and integration with gmail site), but it is interesting to try to figure out how it works and how is it integrated with the rest of google communications suite. Gmail phone calls is a service to make outgoing voice calls from gmail website to international mobile and fixed telephone lines. The charging and the caller id are integrated with google voice (GV) if available for that google account. 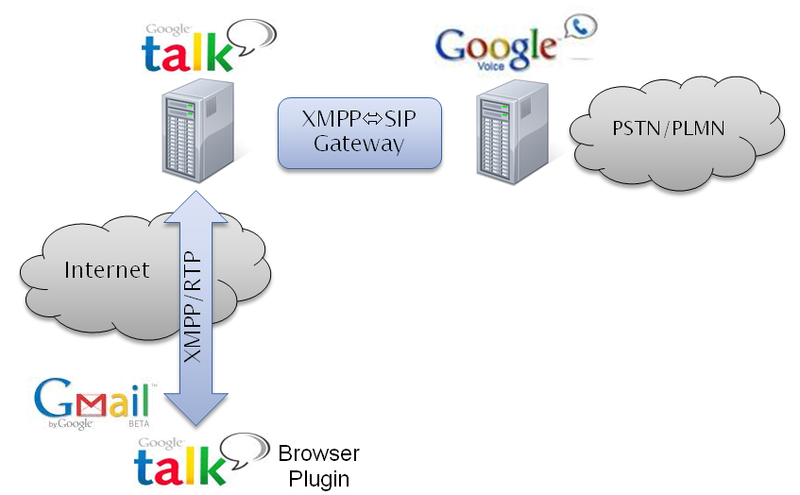 From a technical perspective these are VoIP calls from the web client to the server infrastructure terminating the calls in the telephony network. With a quick traffic sniffing during a call we can see that they are using standard protocolos STUN and RTP and probably the existing XMPP infrastructure for signalling (we have seen some gtalk headers in some HTTP requests) using jingle for session establishment. Regarding the media we have not investigated the codecs being used (although RTP packets size of 172 bytes in one of the calls could be a probe of G711 usage), but Google indicates that they are integrating GIPS technology ensuring high quality algorithms for media management (buffering, echo cancellation...). Taking into account that charging is integrated with GV, probably all the infrastructure to manage calls and termination to the PSTN is exactly the already existent GV infrastructure. The only missing part here is the integration of the Gtalk XMPP based client application with the server infrastructure. 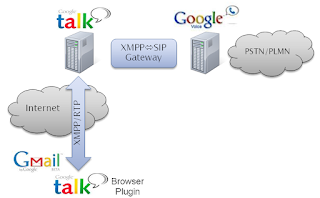 Knowing that GV includes SIP interfaces (you can connect with a SIP gizmo client and probably they are interconnecting with carriers with SIP) probably they have implemented just a typical XMPP to SIP gateway to translate XMPP jingle to SIP signalling and perhaps even transcoding voice when needed. What are your predictions for the future of this feature?